Käpylä Music School (Käpylän Musiikkiopisto/KMO),was fortunate to gain a funding called 'kärkihankerahoitus' from the Ministry of Education and Culture for this project. This funding is really sought-after, so actually the first grader's of Koskela Primary School were really, really lucky to get it! 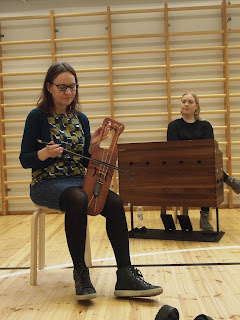 The funding enables now, until the end of the year 2017, 2 weekly lessons of 'folk music emphasized' music lessons for the whole class, and large instrument purchases for the school. The aim of this project is to continue these lessons through all the grades (1st, 2nd, 3rd and 4th). The project is headlined as a project that enables 'the folk music workshops of basic arts education for elementary school students', and the main interest is to increase the availability of the basic arts education in general. The project will be followed-up with the help of this blog, observation (done by me and feedback from the class teachers) and hopefully also by the comments from the parents/guardians of Koskela Primary Schools first grader's! The follow-up will focus on the impacts the music making has on the grouping, the evolvement of community spirit within the group, and the influence the music lessons (basic arts education) might have both, at the individual, and communal level on the students. I (Riikka) will be the principal teacher of this project and am aiming to add some nice news from our activities here regularly. But now, at first I will fill in the information about our lessons from this autumn semester; less than half of the class' students were given permission to be presented in pictures or video so I have to go through all the material really carefully to be on the safe track on that!